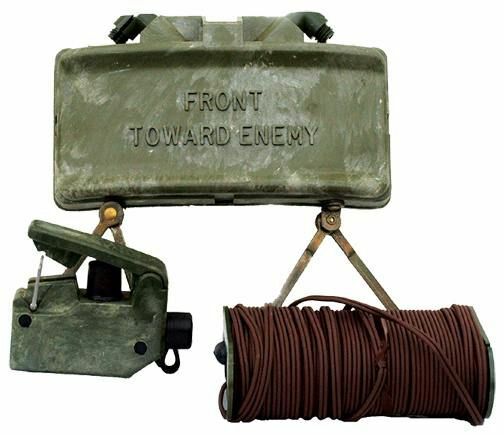 The M18 Claymore Mine was used extensively during the Vietnam War and is a very effective anti-personnel mine. The M18 Claymore is a directional fragmentation mine and is 8.5 inches (21.6 cm) long, 1.375 inches (3.5 cm) wide, 3.25 inches (8.6 cm) high, and weighs 3.5 pounds (1.6 kg). The mine is loaded with 700 steel balls (10.5 grains) backed by a 1.5 pound (0.68 kg) layer of composition C-4 explosive and is initiated by a No. 2 electric blasting cap. The M18 is a command-detonated mine and may be employed with obstacles or on the approaches, forward edges, flanks, and rear edges of protective minefields as close-in protection against an unprotected infantry attack. The Claymore mine propels a fan-shaped pattern of steel balls in a 60-degree horizontal arc with a maximum height of 6.6 feet (2 meters), and has a casualty radius of 328 feet (100 meters). The optimum effective range (the range at which the most advantageous balance between lethality and area coverage is attained) is 164 feet (50 meters). The forward danger radius for the weapon is 820 feet (250 meters). The backblast area is unsafe in exposed areas 53 feet (16 meters) to the rear and sides of the mine. Friendly personnel within 328 feet (100 meters) to the rear and sides of the Claymore mine should be in a protected position to be safe from secondary fragments. Another choice is to sandbag to the rear and sides of the Claymore mine to protect friendly personnel. The M18A1 mine is the improved version and is designed primarily a defensive weapon. The Claymore mine may be employed to a limited extent in certain phases of offensive operations, especially during the beginning phases of the operation. The M18A1 mine has the same basic capabilities as most antipersonnel mines and may be used in most situations where other types of antipersonnel mines are utilized. In addition, the Claymore has the ability to be sighted directionally to provide fragmentation effects over a specific area and does not necessarily rely upon the chance detonation by the opposing forces. The M18A1 mine can be adapted for covering the ranges between maximum hand grenade throwing distance and the minimum safe distance of mortar and artillery supporting fires. The M18 Claymore antipersonnel mine is the earlier model of the M18A1 Claymore antipersonnel mine. The original M18 antipersonnel mine comes in two versions, one with and one without a peep-sight, otherwise, the two versions are indistinguishable. The Claymore mine is a curved, rectangular, plastic case and contains a layer of composition C3 explosive. The front side has a label which is written "FRONT" with "TOWARDS ENEMY" below. The mine has a fragmentation face of rectangular steel fragments. The front face containing the steel fragments is designed to produce a fan-shaped spray which can be aimed at a prescribed target area. The Claymore mine sits of four scissor type legs when positioned for firing. The electrical firing device issued with the original M18 Claymore Mine is not safe. Due to its construction, the firing device may cause premature detonation of the mine. Whenever possible, the battery holder (firing device) issued with the M18 mine should be replaced by the standard M57 firing device. If the battery holder is used, both firing wires should be connected to a single terminal until the desired moment of detonation. Damage: Front 60-degree horizontal Cone: 4D6x10 S.D.C. for a 164 foot (50 meter) range, 2D4x10 S.D.C. for a 328 foot (100 meter) range, and 4D6 S.D.C. for a 820 foot (250 meter) range. Rear and Sides: 1D4x10 S.D.C. for a 53 foot (16 meter) range and 4D6 S.D.C. for a 328 foot (100 meter) range.